Feng Shui can make an immediate change by balancing the elements and using a map called the Bagua. The Bagua originates from the I Ching, or Book of Changes, an ancient Chinese Guide for living. Ba means 8 and Gua means sides. The Bagua is an octagonal shape. Its eight sides represent eight compass points, each governing a fundamental aspect of life. The Bagua Board is used as a map for any room. 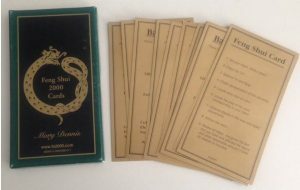 Feng Shui Cards will empower all who use them. Each card contains information specific to one life aspect: Career, Children, Travel, Relationships, Future, Wealth, Family Life, Education and Health. The cards will guide you to the appropriate area of any room that you wish to enhance. 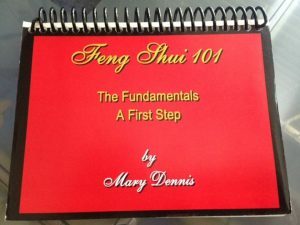 They will also advise you when to activate that area, and how to apply a Feng Shui cure. Universal situations and remedies are provided to adjust the energy of any space. I devoured the contents of this book and immediately set about the task of re-arranging both my work and living spaces. You deserve great kudos for simplifying such a complex ideology. *Shipping and handling apply, at a flat rate of $8.00 in the USA.